Courtesy of: Joe F. Duft. USDA NRCS. 1992. Western wetland flora: Field office guide to plant species . West Region, Sacramento, CA. Courtesy of USDA NRCS Wetland Science Institute. Usage Guidelines. 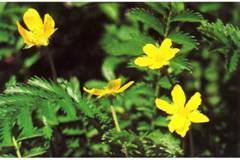 It can commonly be found in coastal wetland areas. Tolerates shade and wetland conditions. The plant may be collected as seed or divisions. No dormancy breaking is necessary. May be stored short term. Information on long term storage was not found in the available literature. Conflicting recommendations exist for what time of year seeds should be sown. One source recommends sowing in mid-winter (7), while another suggests early spring or autumn. Seeds should be sown outdoors in a coldframe, covered containers or an unheated greenhouse. Plants must be installed when fairly developed. Small plantlets and smaller divisions will likely fail. 1. Hitchcock, C. Leo and Cronquist, Arthur. Flora of the Pacific Northwest. 1998. University of Washington Press, Seattle and London. 3. Pojar, Jim, Mackinnon, Andy. Plants of the Pacific Northwest Coast. Canada: Lone Pine, 1994. 4. Kruckeberg, A.R. Gardening with Native Plants. University of Washington, Seattle, WA, 1982.